PARFIX Cyanoacrylate Adhesive or CA glue is usually a single or a two component acrylic resin in the form of a clear liquid. These are normally made of two ingredients – one is used to pour and the other as a hardener. In case of Cyanoacrylate Adhesives, the hardener is Water (moisture). So whenever it comes in contact with moisture in the air, it automatically cures. Since the human skin I naturally moist, sometimes users end up sticking their finger tips or fingers with the substrate of the application. PARSON is one of the leading manufacturer of high quality cyanoacrylate adhesives for wide variety of industrial assembly applications. Parfix range of cyanoacrylate adhesives are triple distilled to provide the highest industrial strength with consistent performance for every assembly applications. Parfix cyanoacrylate adhesives are available from 3 gram tube to 200 kg drum packing. We also offer extensive private label services with no minimum quantity requirement. 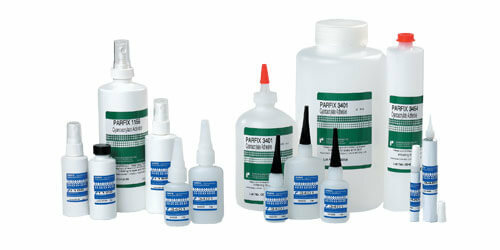 Parson offers complete line of Accelerators, Primers and De-bonder for Cyanoacrylate adhesives. PARFIX accelerators are designed to increase the cure speed and gap-filling capabilities of Cyanoacrylate adhesives. The surface properties of some materials are acidic or contain very low moisture content which slow down the curing of cyanoacrylate adhesives. PRAFIX accelerator is formulated to harden CA in ten seconds or less and it also helps to cure excess CA that oozes out of joints during assembly. PRAFIX accelerator can be applied to one surface and CA to the opposite surface. When brought together, they will bond instantly. PARFIX primers are formulated to ensure cure on inactive surfaces and increase the adhesion on low energy surfaces.